The rendering in the English versions of the Hebrew word "ḥeleb," an animal substance of an oily character deposited in adipose tissues. In Judges iii. 22 it is mentioned as covering the human intestines. It is held to indicate grossness and wickedness of disposition (Job xv. 27). A heart covered with fat is a sign of irresponsiveness and indifference (Ps. xvii. 10, cxix. 70). The fat of beasts is mentioned as rich food (Deut. xxxii. 14). Figuratively, fat connotes the choicest part of anything (of oil, Num. xviii. 12; of wine, ib. ; of wheat, Deut. xxxii. 14; Ps. lxxxi. 17 [A. V. 16], cxlvii. 14). The fat in the thank-offerings belonged to Yhwh (Lev. iii. 16; Ezek. xliv. 15; comp. Lev. iii. ; Ex. xxix.). Like blood, it was regarded as the seat of life (Lev. iii. 17; Smith, "Rel. of Sem." 2d ed., pp. 376 et seq.). In the description of the sacrifice at the consecration of Aaron and his sons (Ex. xxix. 13) the fat covering the inwards, the caul, and the two kidneys with the fat upon them are specified; in Lev. iii. 3 "the fat that is upon the inwards" is added to these. The parts mentioned represent: the omentum (Josephus, "Ant." iii. 9, § 2, ἐπίπλους); the fat clinging to the intestines, i.e., net-like adhesions to the colon (but see Paul Haupt, "Johns Hopkins Circular," 1894, No. 114, p. 115); the kidneys, which, especially near the loins, are as a rule surrounded by fat; and the "yoteret" (see Caul), a deposit of fat extending from the portal ("haẓra") vein of the liver along the hepatic-duodenal ligament to the duodenum. In Lev. iii. 9 the fatty tail of the sacrificial animal, if a sheep, is mentioned as being among the portions which are to be burned upon the altar. This part, as being the choicest, was offered to the guest of honor (Budde, in "Z. D. P. V." 1895, p. 98; Geiger, "Urschrift," p. 380; I Sam. ix. 24). Again, in Lev. vii. 23-25 the fat of three sacrificial animals, the cow, thesheep, and the goat, is specifically prohibited as food, the punishment for infraction being "karet" (excision); but in the case of animals which have died a natural death or have been killed by wild beasts ("nebelah," "ṭerefah"), the fat, while not allowed for food, might be used for any other domestic purpose. It is thus an open question whether, when slaughtered for private (non-sacrificial) use, the fat of the three animals enumerated was prohibited, and it is not plain whether the interdict applied to other animals. For the parts of the sacrificial animal which belonged to Yhwh, and which had to be burned, the Talmud has in addition to the term , a word of disputed etymology (Rapoport, "'Erek Millin," s.v. ; 'Aruk, s.v. , 6, and , 2; Solomon Geiger, in "Zion," 1842, p. 6, from ; comp. Suk. 55b), probably from the Greek μοῖραι, μηρία (i.e., the choicest parts), of frequent occurrence (Suk. v. 7; Yoma vii. 5; Pes. v. 10; Zeb. 27b). 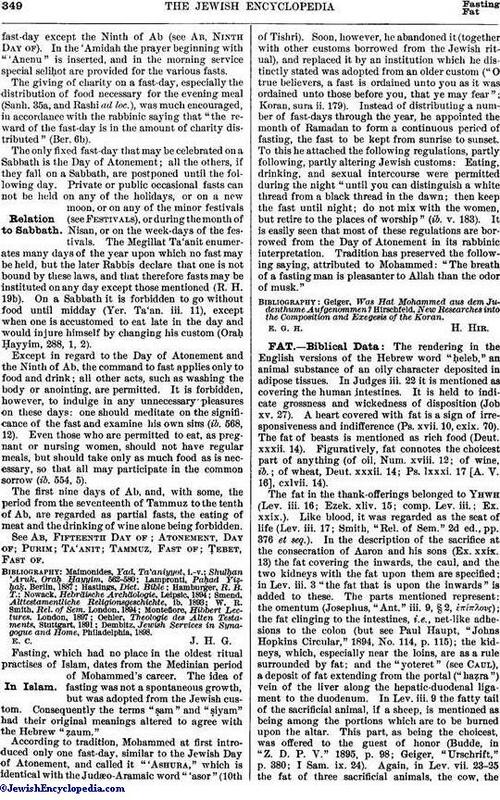 The precise delimitations of the Levitical prohibition, violation of which entailed karet, were a matter of controversy even among earlier Mishnaic authorities (see Sifra, Lev. 3, the opinions of R. Ishmael and R. Akiba; comp. Ḥul. 49b, 50a, those of R. Jose ha-Galili and R. Akiba; Tosef., Ḥul. viii.) and also among the Amoraim (Ḥul. 93a, Samuel [see Rashi and RaN], and Ḥul. 55a, Abayah). The distinction is made between "shumen" and "ḥeleb" (see Ramban to Lev. iii. ), the latter being separate from the meat and consisting of a thin, close-fitting, skin-like layer that may be peeled off (Ḥul. 49a, 50a; see Wiener, "Die Jüdischen Speise Gesetze," p. 149). 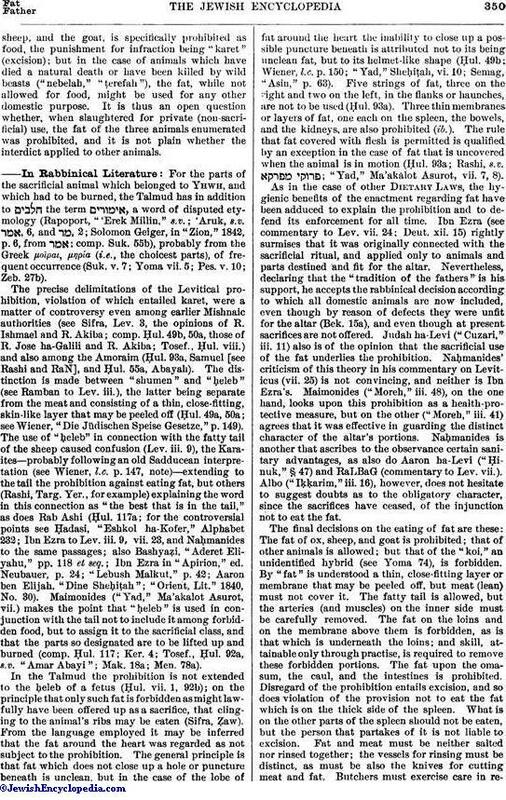 The use of "ḥeleb" in connection with the fatty tail of the sheep caused confusion (Lev. iii. 9), the Karaites—probably following an old Sadducean interpretation (see Wiener, l.c. p. 147, note)—extending to the tail the prohibition against eating fat, but others (Rashi, Targ. Yer., for example) explaining the word in this connection as "the best that is in the tail," as does Rab Ashi (Ḥul. 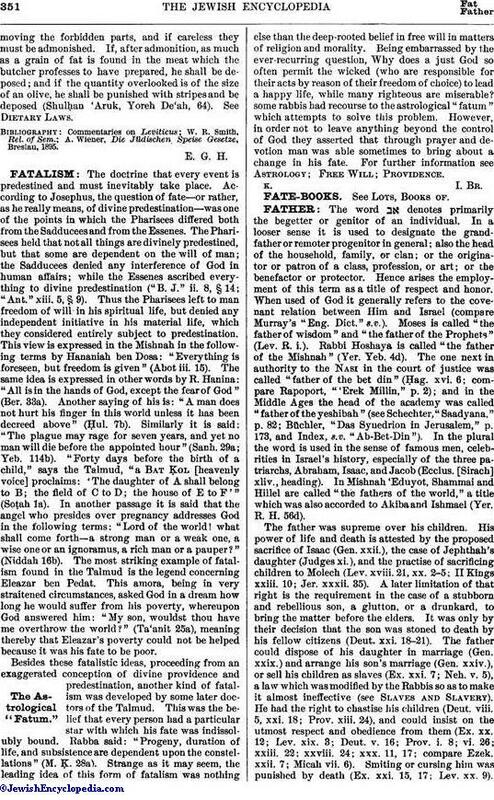 117a; for the controversial points see Ḥadasi, "Eshkol ha-Kofer," Alphabet 232; Ibn Ezra to Lev. iii. 9, vii. 23, and Naḥmanides to the same passages; also Bashyaẓi, "Aderet Eliyahu," pp. 118 et seq. ; Ibn Ezra in "Apirion," ed. Neubauer, p. 24; "Lebush Malkut," p. 42; Aaron ben Elijah, "Dine Sheḥiṭah"; "Orient, Lit." 1840, No. 30). Maimonides ("Yad," Ma'akalot Asurot, vii.) makes the point that "ḥeleb" is used in conjunction with the tail not to include it among forbidden food, but to assign it to the sacrificial class, and that the parts so designated are to be lifted up and burned (comp. Ḥul. 117; Ker. 4; Tosef., Ḥul. 92a, s.v. "Amar Abayi"; Mak. 18a; Men. 78a). In the Talmud the prohibition is not extended to the ḥeleb of a fetus (Ḥul. vii. 1, 92b); on the principle that only such fat is forbidden as might lawfully have been offered up as a sacrifice, that clinging to the animal's ribs may be eaten (Sifra, Ẓaw). From the language employed it may be inferred that the fat around the heart was regarded as not subject to the prohibition. The general principle is that fat which does not close up a hole or puncture beneath is unclean, but in the case of the lobe of fat around the heart the inability to close up a possible puncture beneath is attributed not to its being unclean fat, but to its helmet-like shape (Ḥul. 49b; Wiener, l.c. p. 150; "Yad," Sheḥiṭah, vi. 10; Semag, "Asin," p. 63). Five strings of fat, three on the right and two on the left, in the flanks or haunches, are not to be used (Ḥul. 93a). Three thin membranes or layers of fat, one each on the spleen, the bowels, and the kidneys, are also prohibited (ib.). The rule that fat covered with flesh is permitted is qualified by an exception in the case of fat that is uncovered when the animal is in motion (Ḥul. 93a; Rashi, s.v. ; "Yad," Ma'akalot Asurot, vii. 7, 8). As in the case of other Dietary Laws, the hygienic benefits of the enactment regarding fat have been adduced to explain the prohibition and to defend its enforcement for all time. Ibn Ezra (see commentary to Lev. vii. 24; Deut. xii. 15) rightly surmises that it was originally connected with the sacrificial ritual, and applied only to animals and parts destined and fit for the altar. Nevertheless, declaring that the "tradition of the fathers" is his support, he accepts the rabbinical decision according to which all domestic animals are now included, even though by reason of defects they were unfit for the altar (Bek. 15a), and even though at present sacrifices are not offered. Judah ha-Levi ("Cuzari," iii. 11) also is of the opinion that the sacrificial use of the fat underlies the prohibition. Naḥmanides' criticism of this theory in his commentary on Leviticus (vii. 25) is not convincing, and neither is Ibn Ezra's. Maimonides ("Moreh," iii. 48), on the one hand, looks upon this prohibition as a health-protective measure, but on the other ("Moreh," iii. 41) agrees that it was effective in guarding the distinct character of the altar's portions. Naḥmanides is another that ascribes to the observance certain sanitary advantages, as also do Aaron ha-Levi ("Ḥinuk," § 47) and RaLBaG (commentary to Lev. vii.). Albo ("Iḳḳarim," iii. 16), however, does not hesitate to suggest doubts as to the obligatory character, since the sacrifices have ceased, of the injunction not to eat the fat. The final decisions on the eating of fat are these: The fat of ox, sheep, and goat is prohibited; that of other animals is allowed; but that of the "koi," an unidentified hybrid (see Yoma 74), is forbidden. By "fat" is understood a thin, close-fitting layer or membrane that may be peeled off, but meat (lean) must not cover it. The fatty tail is allowed, but the arteries (and muscles) on the inner side must be carefully removed. The fat on the loins and on the membrane above them is forbidden, as is that which is underneath the loins; and skill, attainable only through practise, is required to remove these forbidden portions. The fat upon the omasum, the caul, and the intestines is prohibited. Disregard of the prohibition entails excision, and so does violation of the provision not to eat the fat which is on the thick side of the spleen. What is on the other parts of the spleen should not be eaten, but the person that partakes of it is not liable to excision. Fat and meat must be neither salted nor rinsed together; the vessels for rinsing must be distinct, as must be also the knives for cutting meat and fat. Butchers must exercise care in removingthe forbidden parts, and if careless they must be admonished. If, after admonition, as much as a grain of fat is found in the meat which the butcher professes to have prepared, he shall be deposed; and if the quantity overlooked is of the size of an olive, he shall be punished with stripes and be deposed (Shulhan 'Aruk, Yoreh De'ah, 64). See Dietary Laws. A. Wiener, Die Juüdischen, Speise Gesetze, Breslau, 1895.